Graves’ disease is an autoimmune disease that leads to overactivity of the thyroid gland (hyperthyroidism). I have Hypothyroid Mom readers struggling with hypothyroidism now since treatment for their Graves’ with radioactive iodine (RAI) or thyroidectomy. I welcome Barbara Lougheed, author of the book Tired Thyroid: From Hyper to Hypo to Healing – Breaking the TSH Rule. First, you have to figure out what your optimal type and dose of thyroid hormone would be. There are three types of medications: levothyroxine or T4, liothyronine or T3, and natural desiccated thyroid. A normal thyroid gland secretes about 100 mcg of T4 and at least 6 mcg of T3 daily. For this reason, most people feel best when some form of T3 is part of their daily dose. Some Graves’ patients report an increase in their antibodies on desiccated thyroid, so these patients prefer synthetic T4 and T3 combinations. Other patients prefer desiccated thyroid. Finding your optimal dose boils down to trying out different combinations. I combine levothyroxine (generic T4) with desiccated thyroid to give me the T3 and T4 my own gland would have produced. 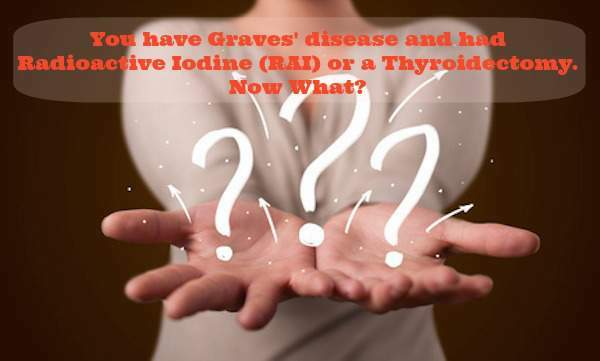 Second, you may still be dealing with Graves’ antibodies, which is a separate issue from not having any thyroid hormone production. The Graves’ antibodies are responsible for conditions like thyroid eye disease (TED) and disfiguring skin conditions (pretibial myxedema, acropachy). Destroying the thyroid gland may have no effect on the Graves’ antibodies, since white blood cells produce the antibodies, not the thyroid gland. In a few unfortunate patients, RAI may actually increase the antibodies and worsen or induce thyroid eye disease, which can be painful and disfiguring. Smokers are at higher risk for this complication. Graves’ antibodies tend to decrease over time after a thyroidectomy or anti-thyroid drug therapy. However, antibodies usually increase significantly during the first three months after RAI, then slowly decrease, but levels can still remain above the reference range even after five years. In some patients, as the antibodies regress, their Thyroid Stimulating Hormone (TSH) returns. In fact, the return of TSH in a Graves’ patient on anti-thyroid drugs is a sign that the medication is working. Some Graves’ patients have achieved remission after years of therapy using anti-thyroid drugs combined with levothyroxine (modified block and replace therapy). Some who underwent RAI treatment suffer from some degree of damage to the stomach, salivary, lacrimal (tear) glands and other organs, because those organs also collect iodine. I did not suffer any severe side effects from the RAI, probably because of the low dose (8 mCi) given to me. Some people are given twice the dose (16 or more mCi), and others have had more than one RAI treatment, because their thyroid glands still produced hormone after the first treatment. I felt terribly hypothyroid 6 weeks after my RAI treatment, but after I’d stabilized on the 88 mcg dose of T4 that was prescribed to me, I don’t remember feeling any differently. However, I was probably hypo to some degree before the RAI. Hypothyroid Graves’ refers to the hypothyroid phase that often precedes the hyperthyroid phase of Graves’. Patients should take both T4 and T3 to replicate normal thyroid gland output, but the TSH level is not a good indicator of whether a dose is correct. Graves’ patients can have a TSH close to zero even if their T4 and T3 are low and below the reference range. A suppressed TSH usually indicates hyperthyroidism, or high thyroid levels, but Graves’ patients have TSH Receptor antibodies that cause non-stop stimulation of the TSH Receptor; this keeps their TSH suppressed even when T4 and/or T3 levels are dangerously low. 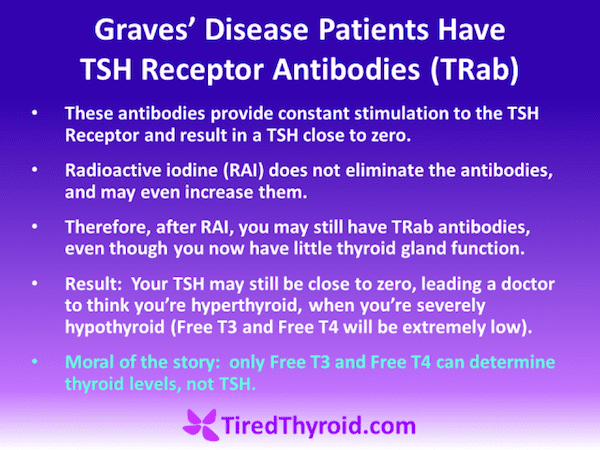 In fact, Graves’ patients who’d had RAI reach TSH suppression on much lower T4 doses than thyroid cancer patients who’d had a thyroidectomy, or patients who simply had non-functioning glands. This may be due to Graves’ antibodies that are still present after RAI. I have no TSH, but I believe this is due to the T3 I take, not active Graves’. TSH drops whenever anyone (not just Graves’ patients) takes any type of thyroid hormone manually, but it does not mean the patient is overmedicated. In fact, because TSH is so sensitive to supplemental thyroid hormone, anyone on T4 with a normal TSH probably has a Free T3 (FT3) level that is lower than that found in healthy people. (FT3 is the blood test that most correlates with symptoms. It is an either or proposition on T4 medication: if TSH is normal, then FT3 must be lower than that found in healthy controls. If FT3 is at a healthy level, then TSH must be lower than normal. Patients cannot have both FT3 and TSH at healthy levels on T4 replacement, and a decision to follow the TSH, especially in a Graves’ patient, leaves the patient undermedicated, sometimes heartbreakingly so. If a Graves’ patient still has active TSH Receptor antibodies (after a thyroidectomy or RAI), then their TSH will remain suppressed or “normal” even though they may have very little thyroid hormone in their body. With no source of thyroid hormone, they can slide into the horrors of myxedema (severe hypothyroid state–person is disabled). Doctors who refuse to prescribe enough thyroid hormone to these patients because of their suppressed or normal TSH have ruined patients’ lives. Barbara Lougheed from TiredThyroid.com had RAI for Graves’ disease in 1993 and takes T4 with desiccated thyroid. She spent years researching thyroid physiology, looking for her optimal dose. She compiled this research into a book called Tired Thyroid: From Hyper to Hypo to Healing – Breaking the TSH Rule . Topics include treatment options for Graves’ patients, a case study of a Graves’ patient who achieved remission using LDN (low dose naltrexone) and tapazole (an anti-thyroid drug), studies that prove that dosing by TSH is illogical, and that T3 is essential because it enhances an enzyme that converts T4 to T3. 1. Bunevicius, Robertas, et al. “Thyroxine vs thyroxine plus triiodothyronine in treatment of hypothyroidism after thyroidectomy for Graves’ disease.” Endocrine 18.2 (2002): 129-133. 2. Batra, Ruchika, et al. “Post-radioiodine De Novo Onset Graves’ Ophthalmopathy: Case Reports and a Review of the Literature.” Seminars in ophthalmology. No. 0. New York: Informa Healthcare USA, Inc., 2013. 3. Laurberg, Peter, et al. “TSH-receptor autoimmunity in Graves’ disease after therapy with anti-thyroid drugs, surgery, or radioiodine: a 5-year prospective randomized study.” European Journal of Endocrinology 158.1 (2008): 69-75. 4. Kabadi, Udaya M., and Bhartur N. Premachandra. “Serum thyrotropin in Graves’ disease: a more reliable index of circulating thyroid-stimulating immunoglobulin level than thyroid function?” Endocrine Practice 13.6 (2007): 615-619. 5. Laurberg, Peter, et al. “Sustained control of Graves’ hyperthyroidism during long-term low-dose antithyroid drug therapy of patients with severe Graves’ orbitopathy.” Thyroid 21.9 (2011): 951-956. 6. Raza, Hasan, et al. “Quantitative evaluation of salivary gland dysfunction after radioiodine therapy using salivary gland scintigraphy.” Nuclear medicine communications 27.6 (2006): 495-499. 7. Aydogan, F., et al. “Effect of Radioactive Iodine Therapy on Lacrimal Gland Functions in Patients With Hyperthyroidism.” Clinical nuclear medicine (2013). 8. Starrenburg-Razenberg, A. J., et al. “Four patients with hypothyroid Graves’ disease.” Neth J Med 68.4 (2010): 178-80. 9. Burmeister, L. A., et al. “Levothyroxine dose requirements for thyrotropin suppression in the treatment of differentiated thyroid cancer.” The Journal of clinical endocrinology and metabolism 75.2 (1992): 344-350. 10. Baisier, W. V., J. Hertoghe, and W. Eeckhaut. “Thyroid insufficiency. Is TSH measurement the only diagnostic tool?” Journal of Nutritional and Environmental Medicine 10.2 (2000): 105-113. 11. Ito, Mitsuru, et al. “TSH-suppressive doses of levothyroxine are required to achieve preoperative native serum triiodothyronine levels in patients who have undergone total thyroidectomy.” European Journal of Endocrinology 167.3 (2012): 373-378. After diagnosis of Graves disease, I chose RAI treatment and have not been happy with results. After two years I am 25 pounds heavier, have swelling legs and aching knees all the time, bouts of hair loss, and deteriorated tear glands that could seriously affect my eyesight in later years (I am 63). My latest labs show THS at a scary 9.33 with my T4 “in range” for a correctly functioning thyroid. My doctor’s response to this … a higher dose of Levothyroxin…75mcg per day!! That seems ridiculously high…I am scared, especially since I already take high blood pressure meds…ideas? Please help! !